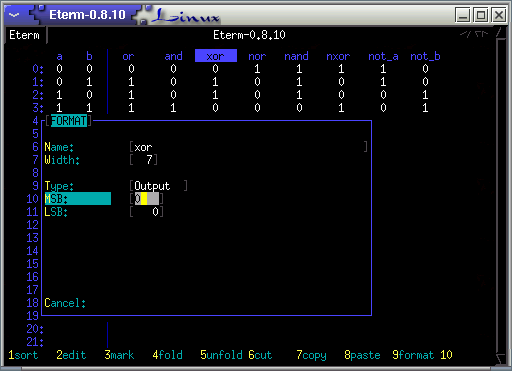 nMicrocoder is a ncurses EDA tool to write microcode. 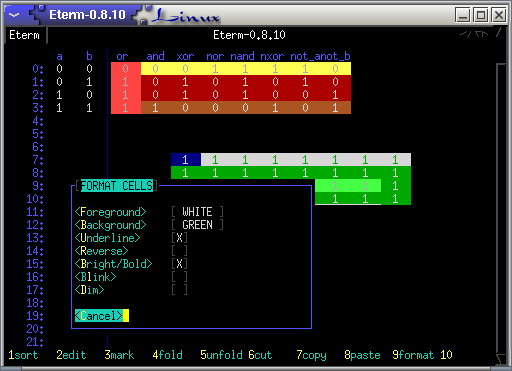 Basically it is a stripped down spreadsheet program which lets you fill a tabular with "0","1" and "-" and gives you compile-ready verilog-code in return. I wrote it, because i figured out that OpenOffice was painfully slow on my notebook (it took 5 minutes just to start! ), and the alternatives didn't suit my needs. It is known to run on Linux, IRIX and Solaris, unless ncurses 5.3 is installed. Version 0.05 makes .frm-files interchangeable between Little- and BigEndian computers possible. This is what the first release looked like. Unfortunatly i lost it, but if somebody from you is interested to see it online again, maybe you can send it to me? It would be great.